When we boarded the ferry to Holland from the UK in May 2014 we were understandably very excited, plus a little relieved to have finally made it. The preceding few months had been hectic to say the least with my illness and our cancelled wedding all catalysing some huge life changing decisions. Then we'd also had to find our motorhome, put most of our worldly possessions into boxes and generally uproot ourselves from our lives in the UK which had been both stressful and exhausting. Boarding the ferry was a real momentous occasion in our lives, but what now? There was so much to see and do and we had no fixed plans. Having thrown off the constraints of our commuter lives we wanted to do it all! However, the reality that we've come to learn over the past 8 months is that a longer motorhome adventure is vastly different from a fixed term holiday and I'm not just talking about the obvious difference in time away. 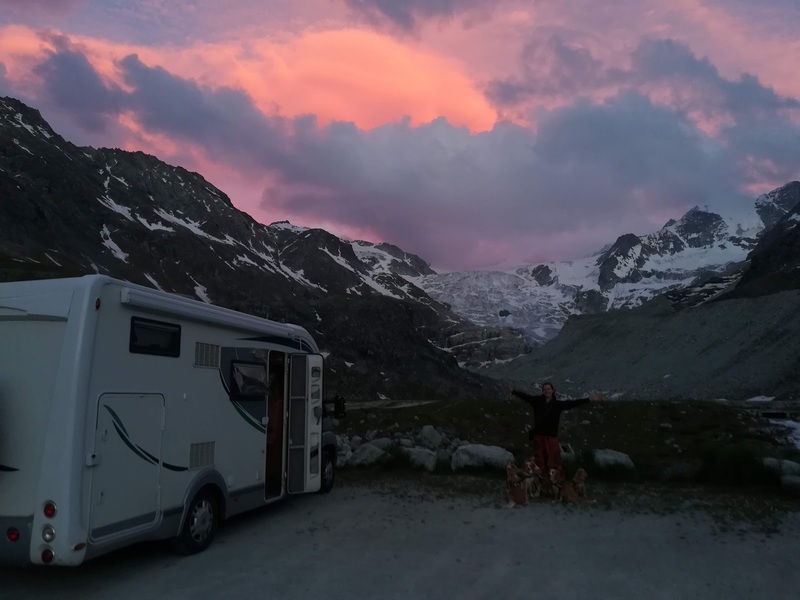 In fact the key difference for us, that we've come to realise the hard way on several occasions, is that if we want to fully enjoy our motorhome adventure we just can't stay in 'holiday mode' all the time. What we've started to refer to as 'holiday mode' is that excited frame of mind where every minute matters, where each day has to be full of something new and exciting and time spent on mundane activities (like washing clothes) just makes you frustrated at the time your 'wasting'. Of course 'holiday mode' makes a lot of sense on a 2 week summer holiday when you can just hit pause on your daily life, ignore your inbox and let the smelly socks pile up because you've packed enough anyway. All that boring stuff can just get done when you get home. However on a longer adventure it's just not possible to ignore the mundane tasks forever. Eventually you will run out of clean pants and socks after all and if you don't want to feel stressed about 'wasting time' dealing with these tasks it's better to recognise and build in time for them separate from your exciting activities. For example, we now set aside days to clean, wash, respond to mail etc. and just do our best to line them up with days when were less likely to be doing something else, like when the weather isn't so great. But really finding happiness in our adventure and recognising the perils of 'holiday mode' has been deeper than simply timetabling in the laundry. In fact, we found early on it was still possible to set aside time for mundane jobs, but still feel in 'holiday mode' the rest of the time. As soon as the washing up was done we'd be chomping at the bit to get out and do something, even if we felt tired and fatigued from other activities. Whilst this was only natural early on in our motorhome adventure, it led to exhaustion and on more than one occasion too. We feel 'holiday mode' is a mindset and for us it was an exhausting one. All our lives we had been used to getting lots done, working more than one job, staying up late until the report was finished etc. and we bought that mindset with us on our adventure. Every day the sun was shining was a chance for a new experience, from the moment it rose until it set behind the mountains we wanted to be out and active, but in the end it just wasn't sustainable. After a few months there had been several occasions where we just felt too tired to get up at all to finally realise it, but we just had to take our foot off the gas if we were going to get the most out of our adventure in the longer term. 'Pushing through' any tiredness was our initial knee jerk response but doing so really meant our enjoyment was massively lessened. We stopped appreciating the scenery, the activities and our adventure. At times, it was as though we were going through the motions. Recognising that rest days were essential but also giving ourselves permission to have them was a big shift in mentality for us, but this change has been vital for us to get the most out of our adventure as a whole. That's not to say we don't still get out a lot! But we've stopped trying to do too much as well. For example, if we've had a long drive in the morning, we'll try rest in the afternoon and explore the next day, instead of taking the bikes off the motorhome the moment we arrived. Or if we'd been hiking all day and set off early, we now no longer also try and fit in a long Skype call home and write our emails before bed as well. It sounds simple, but for 2 people used to burning the candle at both ends this mental shift out of 'holiday mode' is making a massive difference to us. There are exceptions of course. For example, if we only have one more day of sunshine forecast and we really want to try and cycle up a particular col we'll probably push on even if we are feeling a bit fatigued. But by now trying to keep these as exceptions rather than the rule we've started to feel much more alive and energised. Plus, its giving us lots more time to reflect, read and feel connected to each other as well. The key thing for us has been learning to listen to our bodies and minds and recognise when we are getting close to our limit, which isn't always easy since we've noticed it also seems to change with the seasons and the sunshine. We still haven't got it quite right and even recently have caught ourselves doing a little too much alongside some long drives to the south coast of Spain. But now we have started to recognise the onset and dangers of 'holiday mode' for us, we at least have the ability to try and slow down before we hit burn out point again. After all, as a famous singer once said "we have all the time in the world". These are just our thoughts and experience, but if you have any questions or would like to share your own please leave a comment below.